Even before the president sets foot on what many consider hallowed ground, the announcement has sparked new debate on the decision to drop the bomb, and whether the United States should apologize or if a U.S. president should even visit. Obama is expected to make a statement from Hiroshima, and will likely have to navigate a symbolic minefield. It was a moment that literally changed the world nearly 71 years ago when a mushroom-shaped cloud lit up the sky over Hiroshima, and three days later over Nagasaki. 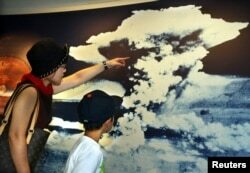 FILE - A mother and son look at a picture of the mushroom cloud atomic bomb blast as they visit Hiroshima Peace Memorial Museum in Hiroshima, Aug. 5, 2002. The bomb dropped on Hiroshima virtually leveled the entire city. About 140,000 people in the two cities died within the year, and survivors and their children have faced untold suffering due to radiation poisoning. 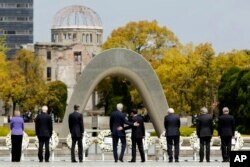 U.S. Secretary of State John Kerry visited Hiroshima last month. He said he was deeply moved and that “every human being” should visit the site. Some experts think that should include the U.S. president, among them Chris Appy of the University of Massachusetts. “I was very pleased that he decided to go. I think just showing up is important symbolic act that many Japanese have wanted for a long time," Appy told VOA. FILE - U.S. Secretary of State John Kerry, center left, puts his arm around Japan's Foreign Minister Fumio Kishida, center right, after they and fellow G7 foreign ministers laid wreaths at the cenotaph at Hiroshima Peace Memorial Park in Hiroshima, Japan. But Appy said he thinks the United States should also apologize for the atomic bomb attacks. But Earnest said the United States does have a “special responsibility” as the only country to have ever used an atomic bomb to work tirelessly for nuclear non-proliferation. ​Republican Senator John McCain is a decorated Vietnam War veteran who ran against Obama in 2008 for the presidency. He told VOA he simply does not see the point of the trip. “I'm not in the business of telling the president of the United States where to go. But where, what is the purpose of it? In some ways, you dredge up very unpleasant memories, but if the president wants to go somewhere he can," McCain said. Obama will be accompanied in Hiroshima’s Peace Memorial Park by Japanese Prime Minister Shinzo Abe. They will lay a wreath, and Obama will make a statement. The White House said the leaders will highlight the horrors of war and the need to work toward a world without nuclear weapons.